How do you quantify color? HunterLab instruments measure the color as it relates to the quality of the product. To be able to begin to measure and quantify color we have to know more about why colors appear as they do. As humans we all see and perceive color differently; this is because the human perception of color is a psychophysical response. 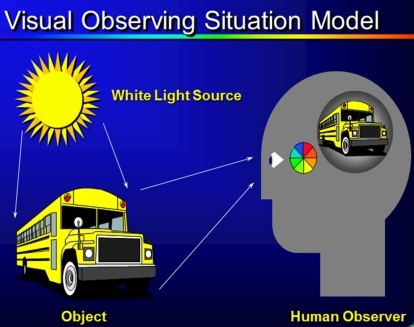 The visual observing situation model shown above illustrates the three components necessary for the perception of color. The first component of the visual observing model is a white light source. This light provides the spectral energy required for viewing color, without light we cannot see colors. The next component needed in the visual observing model is an object. This object modifies the spectral energy from the light source. Colorants, such as pigments or dyes, in the object selectively absorb some wavelengths of the light while reflecting or transmitting others. The last component of the observing model is the human observer. The observer is a human eye that receives the light off or through the object and then the brain provides the perception for the vision. In order to build an instrument that will quantify human color perception each item in the visual observing situation model must be quantified. These three items are all able to be quantified as a table of numbers. This is a series post. We will go into further detail on quantifying white light sources, objects, and observers in subsequent posts.